Iridology is the science and practice that reveals inflammation, where located and in what stage it is manifesting. The, iris (the color part of the eye) reveals body constitution, inherent weaknesses, and levels of health and transitions that take place in a person's body according to the way one lives. Iridology is the science of analyzing the delicate structures of the iris of the eye. •	There are over a million cones and rods that connect the eye and the top of the spine. This provides a communication system from body to the brain and to the iris of the eye. 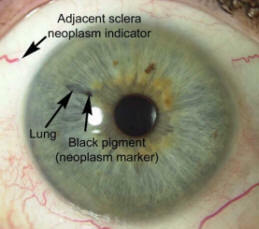 Iridologists assess via an examination of the eye, and charting the marking and colors, and putting this information on an iris chart. These colors and markings reveal weaknesses and strengths in the body, such as a tendency towards a particular disease. For example, the area immediately around the pupil relates to the stomach and the area around that represents the intestines. It is said that the pattern of the iris is like a genetic map of the body, showing inherited traits and pinpointing weaknesses. Changes in this pattern can reflect changes in the body. •	Proclaimed throughout the ages as "windows of the soul", the eyes are now acknowledged as mirrors of the body and likened to miniature television screens recording the condition of the various organs and tissues throughout the body. What it is not Iridology is not a restorative therapy; it doesn’t cure and it doesn't pinpoint particular ailments Iridology identifies weaknesses or over activity in the body so that future problems can be avoided. For example, if the pancreas is seen to be under active, it could indicate a condition like diabetes. Iridology also recognizes where toxins and inflammation could be, as well as certain chemical deficiencies, to determine your general state of health and constitution. How does it work? We use simple but effective tools; pin light flash light, magnifier, a chart or map and draw the color and marking on the chart. Explanation of marking is discussed with the client. Q. Who can use an Iridology Reading? A. Any one who is interested knowing more about themselves, and wants better health. Q. What can I learn from an Iris Reading ? A. The conditions of: The lymph system * Digestive System * Circulatory System * Spine * All major organs * Blood system * Emotional * Inflammation * Degeneration of any system * Healthy areas won’t show up, because they are healthy. Q. Do I really want to know what wrong with me? A: This information can be an intimidating. But for those who take a proactive approach to there health, this information can be a vital tool. Q: Once I know what is wrong with me how do I fix it. A: We work together through: education, product information, traditional and alternative therapies to bring the body back into balance. Q: How often do I need to have a reading? A: That will depend on you; I would like to work with a client for 6-10 months; scheduling follow- up readings monthly. Q: What can I do to help restore my health? A: You are in control. I can only be your advisor, but I have 45 years experience in working with clients, it will depend on your commitment, to adhering to protocols, and simple suggestion, this will determine how soon your body will be back in balance. Q: Will I get sick or feel worse if I change my diet? A: Sometimes when the body is changing from a toxic lifestyle to a healthier one, it may go through a healing crisis. This is a goodthing. It means the body is healing on a deeper level. Q: What can I do now to help myself? A: Drink 3 to 4 glasses of “fresh” juice: (not canned or store bought): Carrot, apple, etc. add an ounce of wheat grass. Drink up to 3/4 gallon of water each day. ONLY Kangen Water. (click here) First thing in the morning start with 2 glasses of water or juice, then 2 glasses 4 more times during the day. (Green drink smoothies) will be sent via email upon request. Q: How can we stay in contact? Gayle Bradshaw has 35 years of experience in the healing arts, including Iridology, colon hydrotherapy, herbology, grief therapy, and nutritional and living (raw)food coach • Raw food class available upon request $25 per person mim of 10 per class.